Within the space of a few years, Sharon Theobald lost both her father to cancer and recently, her younger brother Jason, who sadly passed away aged 40 years old from a rare form of lung cancer. Sharon ran her first half marathon earlier this year. I would be made up if I knew that my story had inspired just one person to run. It has of course been a very challenging time for Sharon and her family. However, the 48 year old Mum of twins from Norwich, has channelled the weight of her grief into something remarkable. 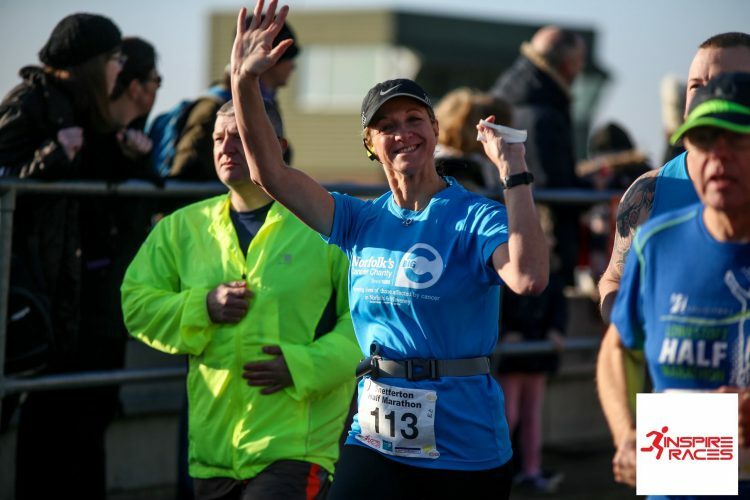 She has been spending her spare time taking part in various running events around the county, including very recently, her first half marathon. Her main running partner? Grief. In the process, she has kindly been raising money for Big C. She has also been blogging about her experiences in running with grief on blog ‘Running with Grief’. Sundays are her long run days. On her blog she writes about her adventures in running, how they inspire, motivate and allow her to often soak up nature, whatever the weather. More often than not, this provides her with the chance to use running, and blogging, to deal with some of her grief and keep her mind on an equilibrium. I think this is what floating in a black hole would feel like, limbo, nothingness under your lead like feet carrying your heavy heart. It [grief] is there, amongst the nothingness, hanging in the air like a giant smoky black cloud just waiting to pounce and engulf me. Sunday was an unusually beautiful autumnal warm sunny day, a glorious day for a run. As well as new fuel I’m trying a new running track, Spotify Time Capsule, I usually run to dance music but decided I needed a change, new route, new music, new fuel. Let’s do this! To support Sharon through fundraising, and her efforts to inspire others to talk and take up a physical activity when grieving, you can also go to her JustGiving page.